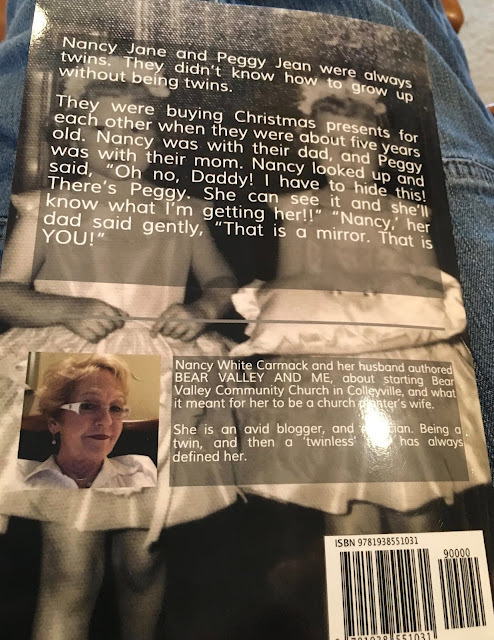 As many of you know, I have been working for years on a book about being a twin and losing that twin. I hadn't worked on it all the time - obviously - as sometimes I would just have to quit - and take some breaths for maybe a few weeks or months. And the actual publishing of it was a major project, that my dear husband oversaw. ANYWAY, we finally did it. Frankly, I thought it wouldn't happen, and it would just serve as a catharsis project for yours truly. And it does serve as that. But I wanted Peggy's kids, and my kids and our grandkids, and whomever else, to learn about Peggy - her life and her death, particularly how she died, which I think is a lesson for everybody. ANYWAY, it's on Amazon.com! 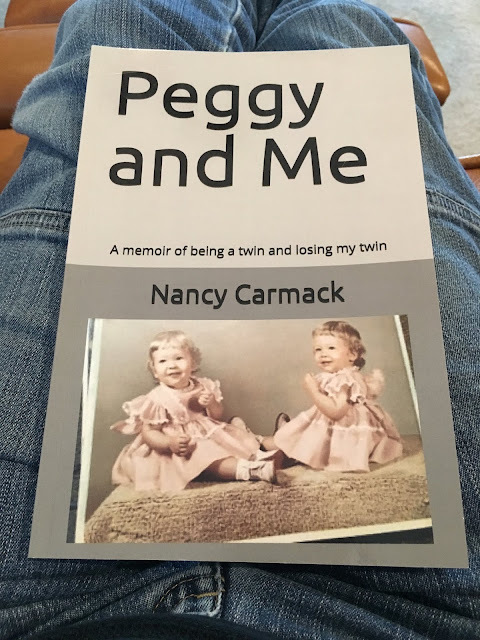 You can look for a Nancy Carmack book and there it will be. I'm sorry I can't give everyone a free copy, but I will to certain people: Cap and Elizabeth (Peggy's kids, - Elizabeth wrote a wonderful epilogue); my kids Will and Laura, so they can get to know their aunt who died when they were four and two years old; and my mom, who of course helped in the memories; my dear writer friend Beth Lahaie who helped me in the writing process (I didn't get rid of all of the ellipses, Beth, but most. ); and my sister and brother-in-law Pat and Ken Ross. Pat encouraged me ALL the way through and Ken helped edit the first draft. Those are special folks and are mentioned in the "ACKNOWLEDGMENTS", which in this book are at the end. You may find errors. Sam and I did the final proofreading and well, we're not perfect. Oh, and the e-book does NOT have pictures, just so you know. And I'd like to thank Kathy Fennell Cranfill and Cyndi Doty Aldrich (and others) who kept encouraging me and are probably totally surprised that I really did finish it! By the way, Peggy died 30 years ago in April. I think it took me that long to get the story told. Fantastic! We are so proud of you, Nancy, for persevering through this lengthy process. Can't wait to read the book and to share with a few friends who are twins. I look forward to reading it, Nancy! Thanks for sharing it with the world.